A homeless transgender kid met a busy entrepreneur on a highway exit, and now she's getting back on her feet. 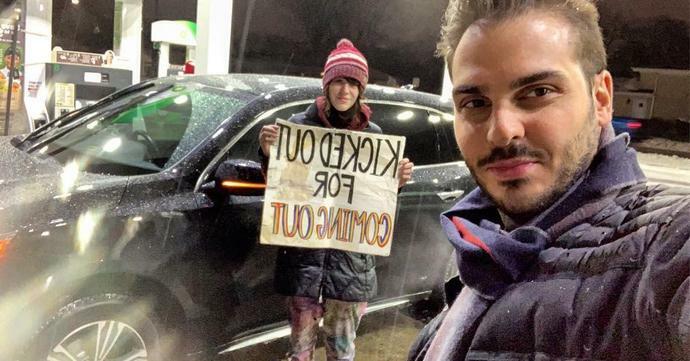 On Tuesday evening, while driving home from work in 20-degree snowy weather, Chicago businessman Aristotle Loumis saw a young adult standing along a highway exit holding a sign that read "Kicked Out for Coming Out." "Pulled over, and to little surprise, she, Maxxi, is a transgender child who was being abused by her religious mother and stepfather, who is now for the first time homeless, on the streets going on 26 days," Loumis wrote on Facebook. "In the middle of a very dangerous, and lethal, Chicago winter. What does one do? Drive by, or help. Most often I try and limit my involvement with the homeless, for obvious reasons of drugs, misuse, and those who take advantage, but it's hard to look past the most vulnerable of them, pregnant women, disabled, children … especially in what can be potentially deadly winter for those who are experiencing it for the first time." Loumis, 28, the founder and CEO of designer eyewear company Ellison, tells Yahoo Lifestyle that he initially drove past Maxxi but was reminded of a gay family member and turned the car around. "She came up and we started talking," he says. "She was homeless for the first time and trying to get to Los Angeles so she could make art and create a company." After talking for a few minutes, they drove to a local Wendy's to eat dinner and to a gas station where Loumis purchased toiletries for Maxxi. He booked a room at the Holiday Inn for Maxxi and her girlfriend, who panhandle during the day and sleep in a van, which they park in a hotel lot at night. He also gave Maxxi $200 in cash. Maxxi, who is from Elmhurst, on the outskirts of Chicago, told Loumis that she needed dental work and medical attention related to hormone therapy. "With no immediate contacts, I asked her if she'd like me to leverage my platform and post a picture in hopes any leaders within the LGBQT community that can reach out and provide some guidance to what I can imagine is a very frightening situation," Loumis wrote on Facebook. He continued: "Her smirk and outlook on life is one that serves as a reminder to all of us that maybe we don't have it so bad. Maxxi, hate that you live a world that will turn a blind eye for who you choose to be, but I promise you that for every villain, there is a hero - like you. You should never be ashamed to be yourself, ever. Keep pushing, better days ahead." Loumis wanted to help once he understood Maxxi's drive. "She needs a job, but she's discriminated against when she tells potential employers that she's transgender," he tells Yahoo Lifestyle. "She's not playing a victim - she really wants to get back on her feet." The entrepreneur got Maxxi's permission to post her photo and email address on Facebook and hopes to enlarge her social and professional circle. When they said goodbye, Maxxi was in good spirits. "I'm hoping that our meeting was a token of confidence that someone believed in Maxxi," Loumis tells Yahoo Lifestyle. "She's a wonderful young lady with a bright future."